The Battle of Honey Hill was the third battle of Sherman's March to the Sea, fought November 30, 1864, during the American Civil War. It did not involve Major General William T. Sherman's main force, marching from Atlanta to Savannah, Georgia, but was a failed Union Army expedition under Brig. Gen. John P. Hatch that attempted to cut off the Charleston and Savannah Railroad in support of Sherman's projected arrival in Savannah. 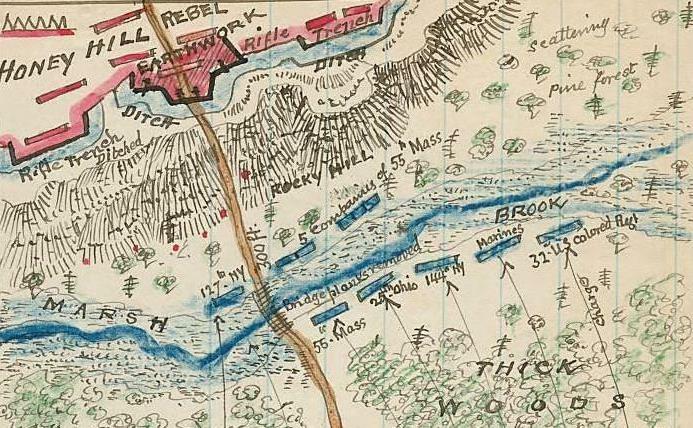 At Honey Hill, a few miles from Grahamville, Gen. Hatch encountered a Confederate force of regulars and militia, under Col. Charles J. Colcock, with a battery of seven guns across the road. 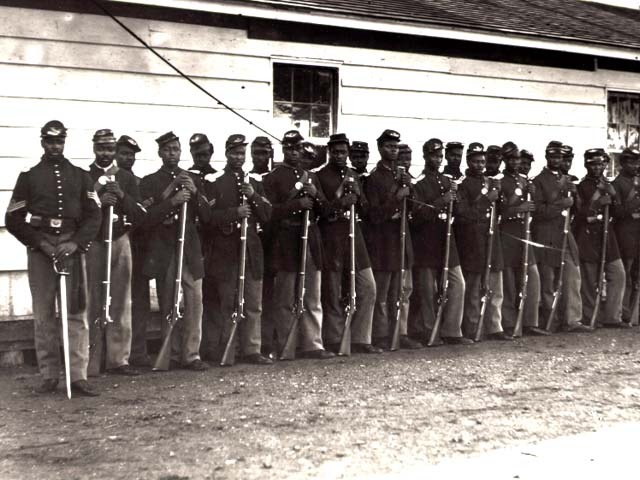 Determined attacks were launched by U.S. African American Troops (including the 54th Massachusetts), but the position of the Union force was such that only one section of artillery could be used at a time, and the Confederates were too well entrenched to be dislodged. Fighting kept up until dark when Hatch, realizing the impossibility of successfully attacking or turning the flank of the enemy, withdrew to his transports at Boyd’s Neck, having lost 89 men killed, 629 wounded, and 28 missing. 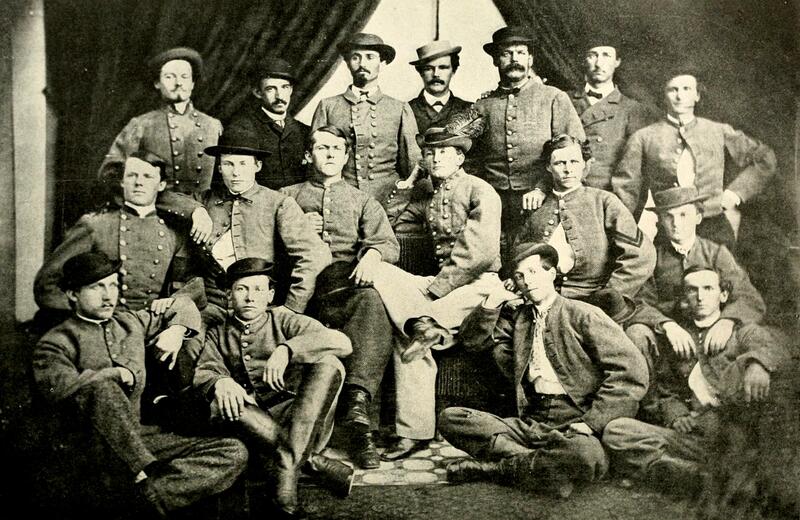 The Confederate casualties amounted to 8 killed and 39 wounded. The battle itself ended in a strategic stalemate that did little more than delay the inevitable Union capture of Savannah by a week. Three Congressional Medals of Honor were awarded after the battle; with a third being awarded in 2001 (posthumously). By December 20, 1864 the Confederates had evacuated Savannah and abandoned the Charleston and Savannah railroad line in Grahamville. 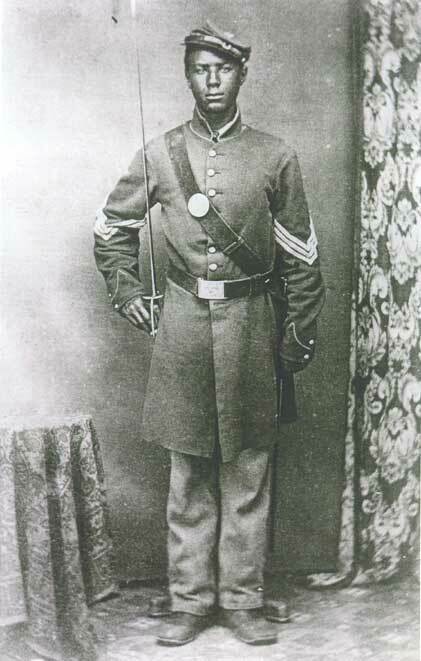 The battle is historically significant because it was the first, large-scale combat engagement by a majority African-American force against Confederate forces and is an integral part of the Reconstruction story as the African American troops engaged in this battle were stationed in Port Royal.